As a mom, I never thought much about Veteran’s Day until after I’d started interviewing World War II veterans for a novel I was writing. Yet as November neared I knew I wanted my children to have the same privilege I did in getting to know the men and women who served our country. When Veteran’s Day arrived we pulled out paper and markers and worked on posters. “Thank you for your service” and “Happy Veteran’s Day,” we wrote. We got in the car and drove to the local Veteran’s Day ceremony. I was saddened to see that we were the only young family present. My kids held their posters as we listened to the speech, watched the 21-gun salute, and teared up as the bugler played Taps. We’d planned on approaching some of the veterans after the ceremony, but they were the ones who approached us. “Can I get my photo taken with you?” they asked. Smiling veterans posed with my kids as their gray-haired wives snapped photographs. I realized then how much us being there meant to these veterans, and after that I started considering what more we could do. 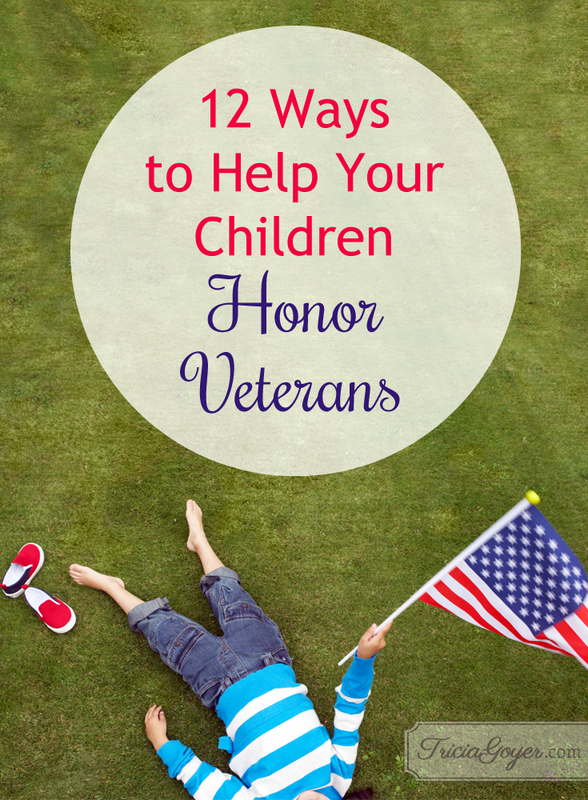 Below is a list of 12 ways you can help your children honor veterans. Some of them I’ve done with my older children. The rest of the list are things I’m planning on doing once my toddler gets older. :: What branch of service were you in? What type of work did you perform? :: Tell me about a couple of your most memorable experiences. :: What is one of the hardest things you faced? :: What was it like to come home? :: Anything else you want to share? 2. If you have older kids, have them do a more formal interview and submit it to the Library of Congress through the Veteran’s History Project. 3. Watch the short films Der Fuehrer’s Face and Donald Duck Army Ranger produced by Disney and discuss World War II. 4. 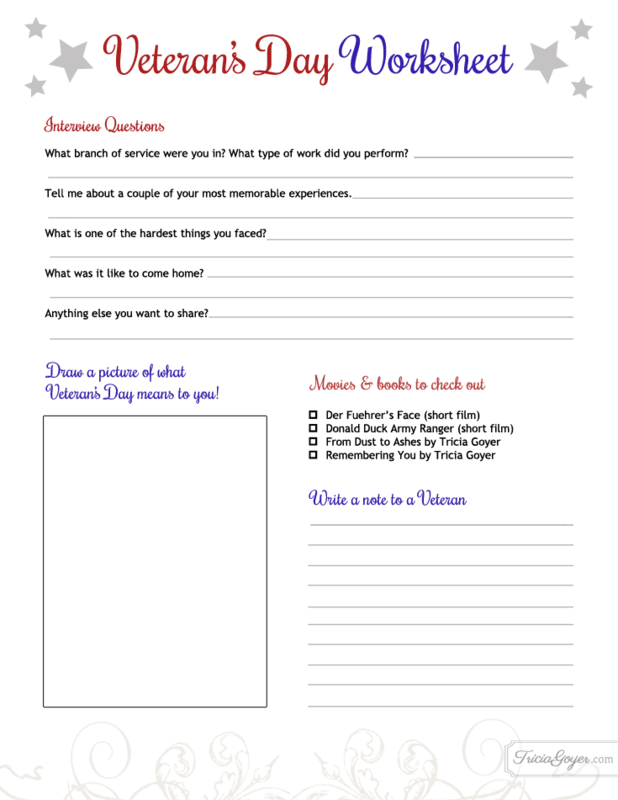 Teach your children about the history of Veterans Day through a Unit Study. Learn about how the holiday got started and about the men and women we honor. 5. Write a letter to a service person through the Packages from Home Project. Those who are serving love to know people think of them and care. 6. Have children draw a picture of Veterans Day, and what this holiday means to them. If your child knows someone in the military, they can draw a picture of that person. 7. Create thank you cards and take them to veterans at a local VA hospital or retirement community. 8. Attend a local Veterans Day parade or ceremony. Make posters to take with you. Take time to introduce yourselves to the veterans afterward. 9. Learn how to properly fold an American flag. Also discuss what each fold means. 10. Call up your local VA hospital or VA organization and ask if there is a way your family can volunteer for the day. Who knows, you might just want to make it a regular occurrence. 11. Read a novel that deals with World War II with your teen. I wrote a few, including From Dust to Ashes and Remembering You. 12. For more activities, check out the FREE Veteran’s Day resource guide. I hope you choose one or more of these ideas to get you started. I know your family will be blessed by the veterans you connect with … and they will be blessed by YOU! Download the printable and work through it with your kids! One thing I would like to add about the interviews is ask the spouse if they would like to add anything. Wives and children make sacrifices too. And I won’t even get started about living below the poverty level in a lot of cases for the families. Thanks for putting this information out.